The balance sheet report shows the balance of each of your assets and liabilities. An asset can be a rural property, a tractor, your bank account (when it's in credit), or accounts receivable (amounts charged to a person but not collected). Whereas a liability can be a mortgage, your bank account (when it's overdrawn), or accounts payable (amounts billed to you but not paid). It's important to note that in a balance sheet, the value held in each account will remain the same in each month unless the value is decreased or increased. For example, if your drawings for the start of the financial year were sitting at $50,000, this value will remain the same throughout the year in each month unless money is repaid, or further funds are taken. Your balance sheet report is accessible under the reports tab, along with all other financial reports. You can customise your balance sheet report to suit you by adjusting the period, showing, and actuals to drop down options. You can further customise the report by clicking additional options which will drop down the option to adjust the basis (cash / accrual), and whether the data is displayed on a monthly or annual basis. 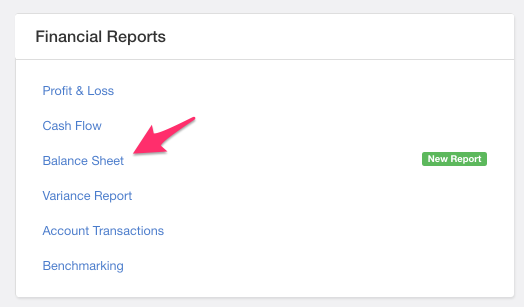 To get the most out of your reports, check out export, copy to clipboard, and save and discuss under share report.